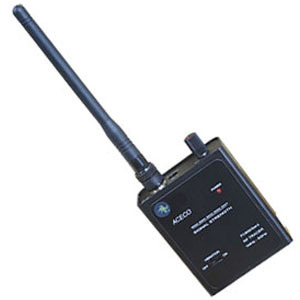 The Aceco FC6003MKⅡradio frequency tracer is useful in locating stuck transmitters or bugging devices in a room or automobile. It excels at silent detecting RF signals for RF security and counter-surveillance applications. Supplied as a complete with internal NiCd pack, AC wall charger, short rubber antenna and earphone. This tracer can operate for up to eight hours from its fully charged NiCd batteries. They are charged when the unit is plugged into the supplied AC/DC adapter. Full recharge will occur over 12 to 16 hours. Before recharging the batteries you should be deep cycled occasionally by allowing them to completely discharge to maintain maximum battery capacity. The NiCd batteries should last for several years. However, it is a good idea to check them every twelve months for signs of corrosion or leakage. Always replace the whole set if any one cell fails. Aceco Electronics, Corp. guarantees the tracer and accessories for one year against defects in manufacture. This warranty does not cover items that have been modified, subject to unauthorized repairs, misuse or abuse. This warranty does not cover damage caused by excessive power levels 15 dBm applied to the signal input.